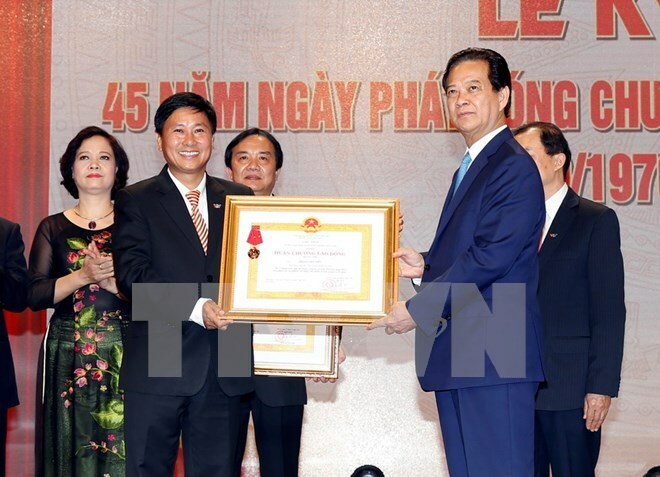 Prime Minister Nguyen Tan Dung and government officials attended a ceremony in Hanoi on September 7 celebrating the 45th anniversary of Vietnam Television (VTV)’s first broadcast. From its humble beginning 45 years ago, VTV has grown into a prestigious broadcasting station in the region with a 4,000 plus-strong staff, a modern technical infrastructure and presence on all continents. Catching up with the world media trends, VTV has taken breakthrough initiatives across management, finance, human resources, market and technology, annually contributing 500 billion VND (22.7 million USD) to the State budget. VTV General Director Tran Binh Minh, in his speech, said VTV strives to be on par with its Asia-Pacific counterparts by 2020, becoming one of the leading TV stations regionally. Addressing the event, Deputy Prime Minister Vu Duc Dam hoped that VTV would broadcast more quality programmes that honour examples of good deeds and fight against negative phenomena disrupting the country’s sovereignty and interests. He called on VTV to rally all possible resources to develop itself into a strong media consortium up to regional stature. Amid the globalisation, VTV should continue fostering the spirit of innovation and creating a broad social unity, making it a factor behind the country’s rapid sustainable development, he added. The PM also took the occasion to present the Labour Order, first class, to VTV broadcasting centre in Ho Chi Minh City, and the Labour Order, second class, to the Department of International Cooperation and 12 outstanding individuals from 2010-2014.